Fancy yourself the next Stevie Wonder or Rick Wakeman? No? Well, you should give Synthesia a go anyway. This brilliant little game works much like Guitar Hero, but for the piano, and is also a great tool if you're learning to play in real life. To play, just select a song and Synthesia will highlight each key you need to hit to play it. There's a good selection of songs in the free game, with varying degrees of difficulty, and more are available if you decide to splash out on the premium version. Depending on how you've set the preferences, it will either pause until you've mashed the right one, or carry on without you and dock points at the end if you didn't keep up. You can play by tapping letters on your ordinary PC keyboard, or attach a MIDI keyboard if you're interested in learning to play properly (or you have one gathering dust in the garage). 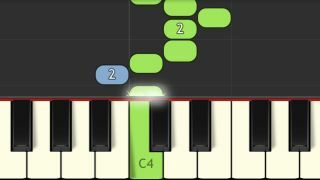 Synthesia lets you play with one hand or both, and there are specific options for practicing the melody (with the song pausing until you hit the right note), the rhythm (with the song moving on at a constant speed), or a full recital (one playthrough at full speed). At the end you're given a grade for your performance - though sadly none of the applause and whoops you get in Guitar Hero, pianists presumably being above that sort of thing.